The Burlington Bees will host a community Blood Drive from 3 PM to 6 PM on Monday, July 14 at Community Field inside the Mississippi Valley Regional Blood Center bus. 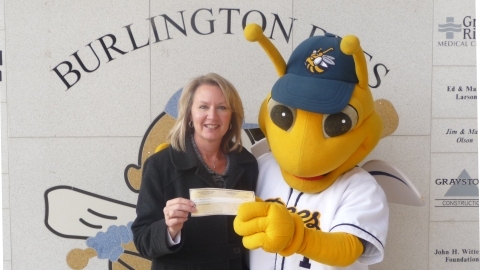 The Burlington Bees recently made a donation of $750 to the Make-A-Wish Foundation as part of the Midwest League’s On-Field Behavior Policy. • Trips – Disney World, Hawaii, cruises, etc. • Gifts – computers, hot tubs, room makeovers, etc.